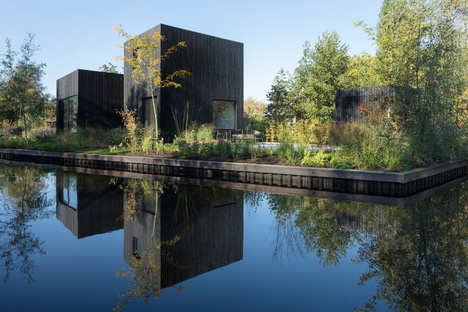 The team formed of i29 interior architects and Chris Collaris, architect, designed a tiny holiday house in Vinkeveense Plassen, the Netherlands. The team formed of i29 interior architects and Chris Collaris, architect, designed a tiny holiday house in Vinkeveense Plassen, the Netherlands. Sustainable architecture for guilt-free relaxation, House of the Year 2019 winner at the Frame Awards. We are often led to believe that plants and the landscape are synonyms for nature in the sense of something that grows naturally and spontaneously. Nothing could be further from the truth, particularly in Europe. Apart from a few rare exceptions, our landscape has been adapted or transformed by human activity, from the alpine pastures to the forests of Scandinavia, culminating in the Netherlands, where much of the national territory is the result of major engineering works. The tiny holiday house designed by the Dutch team formed of i29 interior architects and the architect Chris Collaris is located in their home country, in Vinkeveense Plassen, a recreational lake area popular for its water sports located in the north-west zone of the Dutch province of Utrecht, north-east of the village of Vinkeveen. This outstanding natural landscape is interestingly made up of a series of lakes which formed as a result of peat quarrying hundreds of years ago, in other words, thanks to human activity. The present-day islands in these lakes were created from the piles of peat that was laid out to dry. One particular feature of these lakes is their depth of 50 metres, caused by the fact that the sand was removed from the lakes after world war two in order to build the nearby A2 motorway. In 2014, the partnership in charge of managing the Vinkeveense Plassen began selling off some of these islands, which are now maintained by private individuals. One of these islands is the location of this house whose interiors transmit a perception of space that is much bigger than its footprint of just 55 m2, all harmoniously engaging with the lake landscape. The core of the joint design of i29 with Chris Collaris is the intelligent exploitation of each available square centimetre of the elongated island plot, dividing the architecture into four separate but connecting volumes, each one with a different function. A choice that informed its orientation and to guarantee the right amount of sunlight and scenic views, also assisted by the large windows and sliding doors that can be opened completely so the indoors merge with the outdoors. Inside, the bespoke furnishings, the dimensions and ceiling heights of the volumes clearly articulate the different areas and functions of the home. The visual connection provided by the patio also becomes a physical connection when the doors between the kitchen and the living volumes are opened. For the interiors, the architects opted for simple materials like natural oak or black-stained panels to go with the rough pinewood facade and a seamless polished concrete floor. According to the design team, when it comes to the architectural quality of a home, bigger isn't always better. With a few simple but smart options, you can get really fine results that are also energy efficient, environmentally friendly and built with a small footprint. Based on all of this, the house in Vinkeveense Plassen is a model tiny home: stylish, comfortable with relinquishing quality both in the interiors and in the actual architectural design. Proof of this also lies in the fact that the project is the winner of the House of the Year category of the Frame Awards 2019.